Your dog requires a lot of care, but one of the most fundamental aspects of pet care is feeding. It goes without saying that your pup needs to be fed, but if you want your pooch to live a long, healthy, and happy life, then you’re going to want to feed him the highest quality dog food that meets his unique nutritional needs. There are a lot of premium quality dog foods on the market, which can make it hard to decide which brand you should go with. Blue Buffalo is one of the most notable producers of high quality dog food, but there are dozens of varieties available, including Blue Buffalo wet dog food, Blue Buffalo dry dog food, and more. 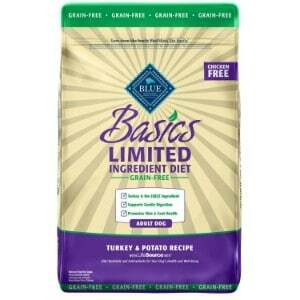 What Sets Blue Buffalo Apart from Other Dog Food Makers? Why is Blue Buffalo the Best Pet Food for Your Dog? Before you decide which option is the best one for your dog’s needs, it’s important to have a full understanding of what each type of Blue Buffalo dog food offers. Below, we offer a more in-depth review of these five options, including the ingredients they are comprised of, what we like about them, and what other users have had to say. Once you’ve decided which Blue Buffalo dog food is the best choice, click on the buttons to find the most affordable prices on Chewy and Amazon. Whether you have an adult Great Dane, French Bulldog, Beagle, or any other type breed (even a pure-bred mutt), it’s important to ensure that you are feeding him the best possible food to meet his unique nutritional needs. With Blue Buffalo Life Protection Natural Adult Dry Dog Food, you will be doing just that. The first ingredient in Life Protection Natural Adult Dry Dog Food is protein-rich chicken. Protein is essential for all dogs, especially adults, as it helps to strengthen their muscles, which is important for joint health (and joint issues are not uncommon among adult canines). In addition to chicken, this recipe also includes whole grains, fruit, and garden vegetables to make a well-rounded, nutrient-rich meal for your furry friend. It also contains Glucosamine, which will further support your pup’s joint health to improve his mobility. Omega 3 and omega 6 fatty acids will keep his skin and coat healthy, too. Lastly, your dog will be able to benefit from BLUE’s LifeSource Bits, which contain a blend of minerals, vitamins, and antioxidants for optimal health. 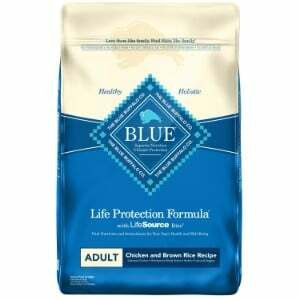 Final Verdict: Though it is a bit expensive, Blue Buffalo Life Protection Formula Natural Adult Dry Dog Food is packed with the vital nutrients that your adult dog needs to ensure optimal health. Pet owners say that their dogs gobble this food up, and veterinarians are impressed by the ingredients. If you are looking for a high quality grain free dog food or a dog food for sensitive stomachs for your pooch, then Blue Buffalo Basics Limited Ingredient Grain Free Natural Adult Dry Dog Food is the way to go. Since it’s made from one source of protein (deboned turkey), and it’s completely free of corn, wheat, eggs, soy, and dairy (like many other dog foods contain), you can rest assured that it won’t aggravate your pup’s sensitive system. Instead, this formula contains healthy carbohydrates that are packed with nutrients, including pumpkin, peas, and potatoes. In addition to being easy to digest, Blue Buffalo Basics Limited Ingredient Diet Grain Free Natural Adult Dog Food contains tons of vitamins and minerals that are essential for the health of your dog. Vitamin B6 and B12, vitamin D12, Omega 3 and Omega 6 fatty acids, and folic acid are just some of the nutrients found in this dog food. It also contains LifeSource Bits, an ingredient that is only found in Blue products, which contain additional vitamins, minerals, and antioxidants. Final Verdict: If your adult dog has a sensitive stomach or other sensitivities and has a difficult time digesting corn, wheat, eggs, or soy, then Blue Buffalo Basics Limited Ingredient Diet Grain Free Natural Adult Dry Dog Food is a great option to consider. Made with easy to digest carbohydrates, deboned turkey, and packed with nutrients, this is a premium quality dog food. For pet owners who are on the market for a dog food that is free of grain but loaded with the essential nutrients that adult dogs need, Blue Buffalo Wilderness High Protein Grain Free, Natural Adult Dry Dog Food is an option worth considering. Just like all other products from Blue Buffalo, real meat is the first ingredient in this formula. Protein sources include deboned chicken, chicken meal, and fish meal. Protein is an essential part of a dog’s diet, as it helps to strengthen their muscles and protect their joints. The addition of omega 3 and Omega 6 fatty acids encourage healthier skin and a healthier coat. Blue’s exclusive LifeSource bits contain a premium blend of vitamins, minerals, and antioxidants, including B vitamins, D3, phosphorous, and folic acid, to promote optimal health for your pooch. It also contains calcium, glucosamine, and omega 3 and 6 fatty acids, as well as amino acids. Completely free of poultry byproducts, wheat, soy, corn, artificial flavors, and preservatives, you can rest assured that your pet will be receiving the highest quality food when you feed him Blue Wilderness High Protein Grain Free Adult Dry Dog Food. Final Verdict: Blue Buffalo Wilderness High Protein, Grain Free Natural Adult Dry Dog Food is another premium quality, grain free formula for adult dogs. With real meat as the primary ingredient, natural carbohydrates, and absolutely no harsh ingredients, this formula is easy to digest and most dogs do enjoy the taste. 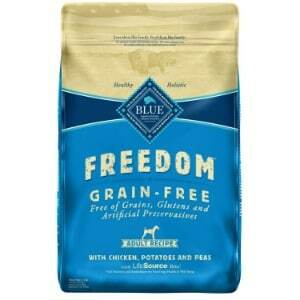 Whether you’re looking for dog food for Yorkies, dog food for Labs, dog food for Boxers, or even a pure bred mutt, if your pup is an adult and require a grain free, high protein diet, than Blue Buffalo Freedom Grain Free Natural Adult Dry Dog Food is another excellent option to consider. Just like every other product from Blue Buffalo, their Freedom Grain Free formula features real meat as the first ingredient. In this formula, protein sources include deboned chicken, chicken meal, and fish meal. Protein is vital for dogs of all ages, but particularly adult dogs, as it helps to maintain the strength of their muscles and could potentially prevent common canine joint issues, such as hip and elbow dysplasia. In addition to the premium quality protein that this formula contains, it also features natural carbohydrates that are free of gluten, and it is completely free of the gluten-based grains that many dog foods contain. Furthermore, this dog food is packed with essential vitamins and minerals, including a full range of B vitamins, vitamin C, and vitamin D. And, as always, it features Blue Buffalo’s signature Life Source Bits, which are packed with antioxidants, vitamins, and minerals that have been selected by animal nutritionists and holistic veterinarians. Lastly, this dog food from Blue Buffalo is completely free of by-product meals, corn, wheat, soy, artificial flavors, and preservatives. Final Verdict: Based on our assessments and the reviews offered by many happy customers, Blue Buffalo Freedom Grain Free Natural Adult Dry Dog Food is an excellent choice for pets that cannot tolerate grain, or for pet owners who just want to offer their dogs a gluten free diet. Made with natural ingredients, loaded with essential vitamins and minerals, and free of gluten, this is another premium quality dog food from Blue Buffalo. For pet owners who are looking for an alternative option to dry dog food for their pups, a premium quality wet dog food, like Blue Buffalo’s Homestyle Recipe, is a fantastic choice. 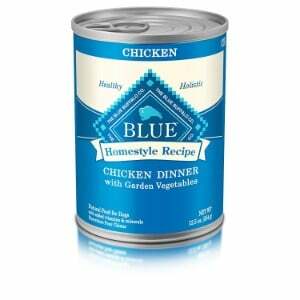 Like all of Blue’s dry dog food options, this wet food formula contains natural meat as the first ingredient, which in this recipe, is natural deboned chicken. It also features a blend of whole grains, garden vegetables (such as sweet potatoes, peas, and carrots), and healthy fruits (including blueberries and cranberries) to make a well-balanced, delicious, and nutritious meal for your dog. In addition to the protein that this wet dog food contains, which is vital for your pup’s muscle and joint health, this formula also contains several vitamins, minerals, and other nutrients that are essential for his overall health and well being. A full range of B vitamins, vitamin A, vitamin D, vitamin E, amino acids, and folic acid are all found in this recipe, so you can rest assured that you will be meeting your furry friend’s nutritional needs when you feed him the Homestyle wet dog food from Blue. You’ll also have peace of mind knowing that it doesn’t contain any byproducts from poultry (which so many other dog foods contain,) and that it is completely free of soy, wheat, corn, artificial colors, and preservatives. Final Verdict: If you’re looking for a premium quality wet dog food for your pup, than Blue Buffalo Homestyle Recipe Natural Adult Wet Dog Food is sure to please. It’s packed with natural ingredients and essential nutrients, so you’ll have peace of mind knowing your pup is eating a well-balanced diet, and your dog will love how tasty it is. When it comes to caring for your pet, you want to ensure that you provide him with the very best of everything. Like most pet owners, you have probably put a lot of research into selecting the highest quality dog crate, the most comfortable dog bed, a dog house that will offer him the utmost protection when he’s outdoors, a spacious outdoor dog kennel where he can enjoy exercise when you can’t do walks, and perhaps even a dog playpen to keep him safe and secure when all eyes can’t be on your furry friend. But of all the products that you offer your canine companion, the type of dog food you feed him is, without a doubt, one of the most important. Like humans, your pet has nutritional needs, and it’s imperative that you offer him a high quality food that can meet those nutritional needs to ensure optimal health. There are dozens of different types of dog foods, such as low protein dog food, organic dog food, dog food for allergies, and even options available for pups of different sizes, including food for large dogs and food for small dogs. There are also countless manufacturers that create meals for dogs. If you’re looking for an option from a reputable manufacturer that you can ensure will meet the unique dietary needs of your four-legged family member, than Blue Buffalo is certainly an option that you are going to want to consider. What is Blue Buffalo? What makes this dog food manufacturer stand out from the crowd? Why should you consider feeding your pup Blue Buffalo dog food? In this section of our review, we provide more information about one of the most trusted makers of food for canines: Blue Buffalo. Owned and operated by the Bishop family, Blue Buffalo is committed to providing canines with the highest quality foods that are contain all natural ingredients and non of the harsh stuff that many other dog food formulas contain. The Bishop family decided to start creating their premium quality products when they learned that their dog, who was named Blue, was suffering from health complications. Because of Blue’s health conditions, he couldn’t safely eat other types of food that were on the market. Furthermore, the family learned that the best way to help their beloved pet was by feeding him all natural ingredients. That’s exactly why they decided to start making Blue Buffalo. 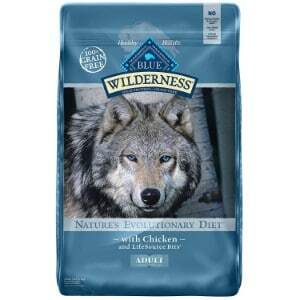 For more than a decade, Blue Buffalo has been proudly making premium quality food for dogs. In addition to the outstanding food they make, Blue Buffalo is also committed to helping find a cure to animal cancers, as well as assisting animals that are in need. In other words, the makers of Blue Buffalo dog food have the best interest of pets in mind. As mentioned (and as you probably already know), there are so many different companies and manufacturers that make dog food. So, what is it that sets Blue Buffalo apart from the crowd? It’s the high-quality ingredients that their products contain. Additionally, Blue Buffalo has created what they refer to as “LifeSource Bits” to further enhance the nutritional content of their dry dog food. These bits contain blends of antioxidants, vitamins, and minerals that were hand-selected by animal nutritionists and holistic veterinarians to ensure that dogs are receiving the best possible nutrition. When it comes to food for your canine companion, there are so many options to choose from. But, if you want to ensure that your furry friend is eating the best possible food, made with the highest quality natural ingredients, and completely devoid of harsh ingredients, such as corn, wheat, byproducts, preservatives, and fillers, then Blue Buffalo’s line of pet food is certainly the way to go. By feeding your four-legged family member Blue Buffalo food, you can ensure that he will be receiving the vitamins, minerals, and other essential nutrients that he needs. Thanks to the high quality proteins that their pet food contains, your pup’s bones and muscles will be strengthened, and the amino acids will help to improve the health of his coat and skin; and those are just some of the ways that Blue Buffalo can improve his health! Additionally, since this line of food is free of harsh ingredients, his digestion will improve and you won’t have to worry about adverse effects, especially if he suffers from food sensitivities. In other words, by feeding your dog Blue Buffalo, you’ll have peace of mind knowing that your pet will be receiving optimal nutrition; and he’ll be happy knowing that you care enough to feed him food that is not only delicious, but also nutritious. The food you feed your pup plays a big role in his overall health and well being. By feeding him a premium quality dog food that contains natural ingredients and all of the essential vitamins, minerals, and nutrients that he needs – and none of the harsh fillers and preservatives that he doesn’t – you can ensure that your four-legged family member will not only be healthy, but that he’ll be happy, too!